"We can’t compete," added Ninola. "They have more machines, more workers. They work everyday. I can do only three or four sets in one week. They do twelve to fifteen." Individual weavers like her take specific orders from people, and not bulk orders. Nearly 70 years ago, Mahatma Gandhi remarked that the women of Assam could weave dreams on their looms, but that does not apply to the local weavers any more. Like most other traditional industries in India, silk weaving industry is also going commercial and is dominated by entrepreneurs, many of them locals; and the traditional weavers have to work for them as wage earners. Two local weavers confirmed that with the cost of the thread going up, they had to take their loom and join a cluster (factory). Both of them work for an entrepreneur who has 12 looms in one small hut, employing as many weavers on a daily wage. Male weaver Promode Das said that they need to earn at least 500 rupees a day for a reasonable livelihood and they get only 50 rupees now. "If anyone pays us better, we will take our loom and go there…. even if it is outside the village," he added. "We have to compete with outsiders (for these jobs) who come to work here," retorted his female fellow weaver Dipti Das. Promode complained that shops here bring in silks from Benares and sell to those who come to buy Assam silk, which is undermining the local weaving community. "They have better technology, use cheaper thread (but) everything (is) done professionally," he said. "We do it by hand (loom) here. So for the time we spend, we don't get enough money for it." It is the lack of a marketing structure to help local individual weavers that is depriving them of sustaining their traditional way of livelihood. During the 2015 general election campaign, when Congress leader Raul Gandhi visited the community, the weaving women complained to him about outsiders entering their traditional domain and along with it bringing cheap thread that is undermining their traditional weaving industry. The Muga thread, which is known for its longevity when turned into fabric, is found only here, but other cheaper threads like Pat and Eri – known as poor man's silk traditionally used in the home spinning industry – are now commonly used in the local weaving industry, sometimes mixed with the Muga. Panchayat (local council) President Sadhani Das told IDN that surveys done by her council with local weavers have confirmed this trend. She added that to safeguard the reputation of the local industry a government certified trademark to show that the product is authentic has been introduced. "The town is supported by the weaving industry," she pointed out, but whined, "the government has given us no role to play." Weaving in this area has a long and rich history. Though it is widely believed that Sualkuchi as a silk weaving village was established in the 17th century, records have been traced back to around 10th-11th centuries of the period of the Pala dynasty, when the King sponsored the craft by bringing the Tanti weaving community from Tantikuchi to Sualkuchi. The village is even mentioned in 'Arthashastra' – an ancient Indian treatise on statecraft, economic policy and military strategy written in Sanskrit – by the name of Suvarnakudya, where the best quality of Patrorna (Pat) was produced around the 4th century BCE. Likely to be the work of several authors over centuries, Kautilya, also identified as Vishnugupta and Chanakya, is traditionally credited as the author of the text. But, Suvarnakudya has taken shape as a weaving centre after the defeat of the Muslim Mughal rulers in the mid-17th century, when the fabric was a luxury, only worn by the royalty and families of the Nobility in Assam. With the growing desire to go back to its roots, the Assamese as well as other Indians across the vast subcontinent are clamouring for Assam silk made in to contemporary dresses including traditional outfits originating in the Indian subcontinent, such as 'shalwar kamiz', 'sarees' and 'shawls'. It is reassuring for visitors from the subcontinent that the rich tradition preserved to this day is attracting attention in the 21st century. There is even a demand for it from overseas buyers. 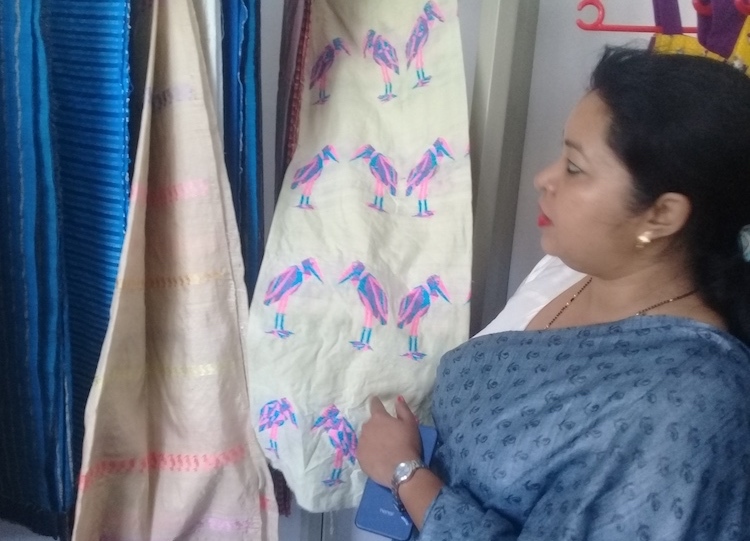 In response to the growing demand for Assamese silks, the Sualkuchi village is home to the Institute of Fashion Technology, which is funded by the Assamese government and trains young people from across India in design technology, fashion design and manufacturing of fabrics. Niranjali Kokaty, head of the Institute of Fashion Technology explaining how they include traditional motifs in contemporary dresses in their design courses. Credit: Kalinga Seneviratne | IDN-INPS. The Institute's head Niranjali Kakoty told IDN that they teach them the whole process from how to take the silk from the silkworm, colouring the thread, to doing the graphic card for the looms, operating them as well as fashion design. All the students are taught free because large Indian companies like Tata sponsor them. "We do not affect the traditional sector because we teach transformational design and we train students to do more contemporary things," Kakoty explained, adding: "We teach how to do a diversity of products (designs) from silk fabrics (and) design for new markets … there are a lot of cluster operators here who absorb our graduates." She also added that there is a lot of scope in the industry for her graduates and she gets calls from entrepreneurs almost "every other day" wanting to employ the newly trained. "Most of our graduates get employment as designers or master trainers and get well paid," said Kakoty, while showing how their students have designed new fashionable dresses taking traditional motifs like the migratory stork that comes to the community. "There's a huge market and no one has to fight for it (because) it is in Assam itself," she said, adding that it's the cluster operators who do most of the marketing. Local shop owner Manoj Das says that earlier they used to only do wholesales. "Now the roads are good and people come here to buy the local product" but, he added, that some shops bring the silks from Benares made with a mixture of Muga and other threads and sell it here. "They sell at the same price here as a local product, (but) outside they sell the same at a lower price," he told IDN. With both outside products and outside hands invading the community, traditional weavers have reason to worry, ironically at a time when demand for the local product is growing. Photo (top): Silk weavers of Sualkuchi in Assam, Promode Das and Dipti Das. Credit: Kalinga Seneviratne | IDN-INPS. Photo (centre): Niranjali Kokaty, head of the Institute of Fashion Technology explaining how they include traditional motifs in contemporary dresses in their design courses. Credit: Kalinga Seneviratne | IDN-INPS.